Piecing together the history of ancient ceramic objects can be difficult, especially when all that remains is a few small shards. However, clues about the authenticity and provenance of such artifacts can often be hidden within their chemical make-up, from components in the clay to the pigments used within the glaze. Unraveling that chemical information could soon become much simpler thanks to a software solution developed by Marc Garland and co-workers at the A*STAR Institute of Chemical and Engineering Sciences. Garland and his team recently developed an algorithm called band-target entropy minimization (BTEM) to help identify the individual chemical components within a complex mixture. They originally developed the software to analyze reaction mixtures in the chemistry lab, but they have now shown that—in combination with Raman spectroscopy—BTEM is equally effective for assessing shards of ancient Chinese ceramics. Raman spectroscopy is a well established, non-destructive chemical analysis technique. The process involves shining laser light at the object and measuring how the light is scattered. The wavelengths of light that get scattered are characteristic of particular chemical components in the object. However, the scattered light can be weak, leading to a low signal-to-noise ratio, and mixtures can produce highly complex spectral data that are difficult to resolve. 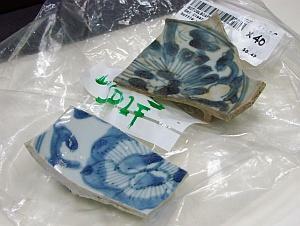 To test their Raman-BTEM approach, the team analyzed a set of Chinese pottery shards (pictured) with known provenance. The researchers detected cobalt oxides—the blue pigments used during the era to give the characteristic blue color to the glaze—in the Ming dynasty shards, as well as hematite (an iron oxide) in the red-colored glaze of a Qing dynasty shard. More information: Widjaja, E., Lim, G. H., Lim, Q., Bin Mashadi, A. & Garland, M. Pure component Raman spectral reconstruction from glazed and unglazed Yuan, Ming, and Qing shards: a combined Raman microscopy and BTEM study. Journal of Raman Spectroscopy 42, 377–382 (2011).